Abstract. 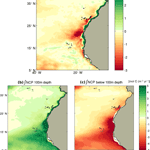 A compilation of measurements of net community production (NCP) in the upper waters of the eastern subtropical North Atlantic had suggested net heterotrophic conditions, purportedly supported by the lateral export of organic carbon from the adjacent, highly productive Canary Upwelling System (CanUS). Here, we quantify and assess this lateral export using the Regional Ocean Modeling System (ROMS) coupled to a nutrient, phytoplankton, zooplankton, and detritus (NPZD) ecosystem model. We employ a new Atlantic telescopic grid with a strong refinement towards the northwestern African shelf to combine an eddy-resolving resolution in the CanUS with a full Atlantic basin perspective. Our climatologically forced simulation reveals an intense offshore flux of organic carbon that transports about 19TgCyr−1 away from the nearshore 100km over the whole CanUS, amounting to more than a third of the NCP in this region. The offshore transport extends beyond 1500km into the subtropical North Atlantic, adding organic carbon along the way to the upper 100m at rates of between 8 and 34% of the alongshore average NCP as a function of offshore distance. Although the divergence of this lateral export of organic carbon enhances local respiration, the upper 100m layer in our model remains net autotrophic in the entire eastern subtropical North Atlantic. However, the vertical export of this organic carbon and its subsequent remineralization at depth makes the vertically integrated NCP strongly negative throughout this region, with the exception of a narrow band along the northwestern African shelf. The magnitude and efficiency of the lateral export varies substantially between the different subregions. In particular, the central coast near Cape Blanc is particularly efficient in collecting organic carbon on the shelf and subsequently transporting it offshore. 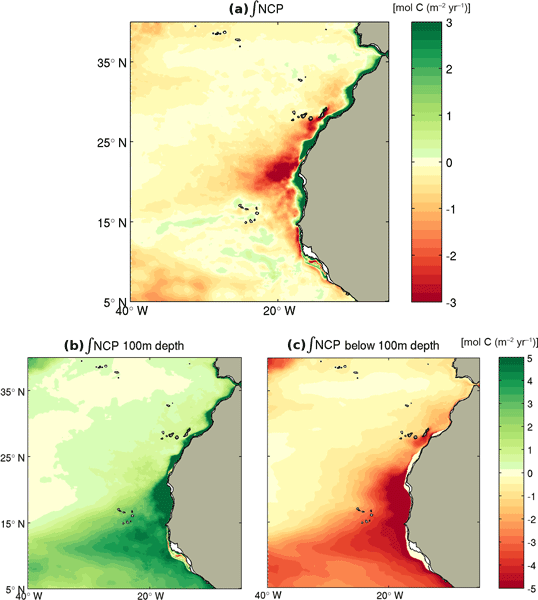 In this central subregion, the offshore transport adds as much organic carbon as nearly 60% of the local NCP to the upper 100m, giving rise to a sharp peak of offshore respiration that extends to the middle of the gyre. Our modeled offshore transport of organic carbon is likely a lower-bound estimate due to our lack of full consideration of the contribution of dissolved organic carbon and that of particulate organic carbon stemming from the resuspension of sediments. But even in the absence of these contributions, our results emphasize the fundamental role of the lateral redistribution of the organic carbon for the maintenance of the heterotrophic activity in the open sea. How to cite: Lovecchio, E., Gruber, N., Münnich, M., and Lachkar, Z.: On the long-range offshore transport of organic carbon from the Canary Upwelling System to the open North Atlantic, Biogeosciences, 14, 3337-3369, https://doi.org/10.5194/bg-14-3337-2017, 2017. We find that a big portion of the phytoplankton, zooplankton, and detrital organic matter produced near the northern African coast is laterally transported towards the open North Atlantic. This offshore flux sustains a relevant part of the biological activity in the open sea and reaches as far as the middle of the North Atlantic. Our results, obtained with a state-of-the-art model, highlight the fundamental role of the narrow but productive coastal ocean in sustaining global marine life.